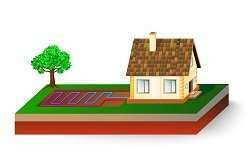 A novel geothermal heat pump makes cost-effective, energy-efficient heating and cooling of buildings a reality. How? By harnessing heat sources from the air or ground. An international team of researchers has joined forces to meet Europe's rising need for affordable and efficient geothermal solutions. Their work, which has received EU support through the GEOTeCH project, focuses on providing cost-efficient renewable heating and cooling for houses and small buildings. The GEOTeCH team has targeted this market for a good reason. According to the International Energy Agency, buildings are responsible for 30 % of global energy consumption and a substantial percentage of CO2 emissions. Heating, ventilation and air conditioning systems in particular make up about half of the energy used in buildings. And the sector is expanding, which makes reduced energy consumption and the use of renewable sources even more important. Project partners have used advances made in geothermal heat pump technology to develop a novel dual-source heat pump (DSHP) unit for heating, cooling and domestic hot water production. An article published in the International Journal of Low-Carbon Technologies provides information on the system's characteristics and performance. The innovative DSHP takes advantage of either air or ground heat sources, depending on operating and climatic conditions. It's able to select the most favourable heat source or heat sink (for heating or cooling, respectively) in a way that allows it to operate as an air-to-water or brine-to-water heat pump. Therefore, in winter it can provide hot water for heating buildings, using either the air or the brine from the ground as heat sources. Alternatively, in summer, it uses the air or brine as a heat sink to provide cooling. The unit also ensures year-round domestic hot water, which in summer it can generate using the system's condensing waste heat. The pump is being demonstrated and monitored in four sites across Europe, one of which is UK project partner De Montfort University Leicester (DMU). Five boreholes have been drilled at DMU in locations where there was enough soft ground to drill down at least 10 m. Heat exchangers have been installed in four of the boreholes. In the fifth hole, temperature sensors have been set up to record data on changes in ground temperature. Data is also being recorded on energy consumption and comfort levels in the demonstration site, which replicates a small domestic building. "Geothermal energy is the future – it's a clean and sustainable source of power," says Prof. Greenough of DMU in a news item posted on the University's website. "It does not produce greenhouse gases that can be harmful to the atmosphere. We want to know more about how heat pumps perform to support their rapid use across Europe. Most people rely on gas but there is a limited supply of fossil fuels, whereas geothermal heat pumps can make use of the practically limitless heat from the sun that falls on the ground and warms the air around us. People wrongly think that these heat pumps are expensive and that you need a lot of space to install them, but that need not be the case." Through its research, GEOTeCH (Geothermal Technology for €conomic Cooling and Heating) is promoting more widespread use of renewable heating and cooling systems in the future. Heat is not properly used ? Nobel Prize Winner Robert leading the Energy Storage Effort, Biggest Limitation of Renewable Power With Bill Gates' $1 Billion Energy fund ! The plan is to store thermal energy, converted from solar and wind electricity, in giant tanks of molten salt. Is Heat from Volcano sites ignored ? Why not set up near them ? Regarding THERMAL ENERGY : Chile has Calbuco Volcano & Atacama Desert, The Driest Desert in the world; It should start Pumping in & Filling up the Volcano with Sea Water as an Experiment and see Whether the Desert receives Rain water (i.e FRESH WATER) or Not ! It can stop it at any time, if anything unexpected is observed ! REMEMBER, ALL VOLCANOES IN THE WORLD ARE CLOSE TO OCEANS !